Transform your existing recessed lighting into a pendant or light fixture. This unique patent-pending Recessed Light Converter offers a quick and easy home upgrade with no major remodelling. Hang any pendant or other light fixture of 50 lbs. or less where recessed lighting is currently used in your home. The Recessed Light Converter adjusts to any can size between 4 in. and 6 in., there are no visible screws or hardware and the decorative medallion can be painted to easily match any decor. This converter works with existing recessed cans that use medium base PAR16, R16, A19, R20, PAR20, BR25, BR30, R30, PAR30, BR38, PAR38, BR40 or R40 light bulbs and is suitable for damp locations. Perfect for kitchens, family rooms or anywhere recessed lighting is used. It includes a versatile white decorative medallion, adjustable bar, socket adapter and mounting hardware for convenient installation. White decorative medallion can be painted to match any décor. Adjusts to fit any recessed can size between 4 in. and 6 in. 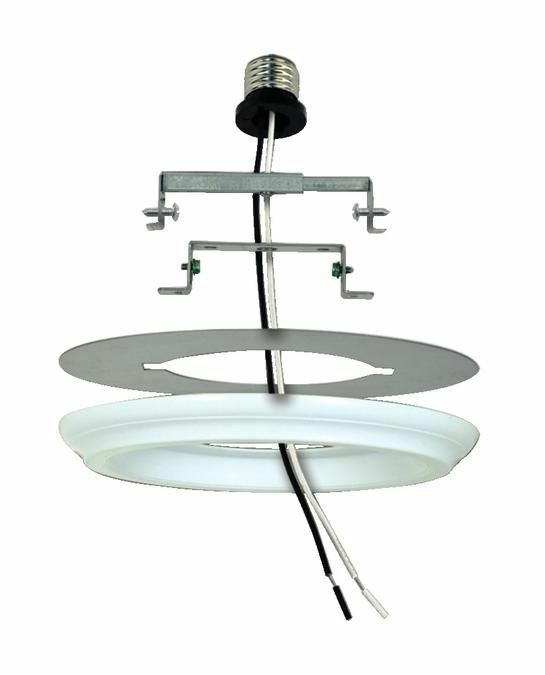 Unique patent-pending design allows you to transform existing recessed lighting into a pendant or other light fixture. For use with pendants or other light fixtures of 50 lbs. or less. Globe Electric's 10 pack 4 inch Swivel Spotlight Recessed Lighting Kit with round trim and white finish is the perfect way to brighten up the interior of your home or commerce with style. Featuring patented PUSH-N-CLICK clips which are fully adjustable and extra wide to grip uneven surfaces and provide easy tool-free installation. A swivel light bulb gives you the ability to focus light on specific areas and can be directed for any desired look. An integrated cut-off switch ensures that the fixture will not overheat and can be used with or without an insulation box. Requires ten 50W equivalent MR16 GU10 light bulbs (sold separately). Dimmable with compatible bulb and dimmer switch. Recessed Light Converter for Pendant or Light Fixtures Transform your existing recessed lighting into a pendant or light fixture. This unique patent-pending Recessed Light Converter offers a quick and easy home upgrade with no major remodelling. Hang any pendant or other light fixture of 50 lbs. or less where recessed lighting is currently used in your home. The Recessed Light Converter adjusts to any can size between 4 in. and 6 in., there are no visible screws or hardware and the decorative medallion can be painted to easily match any decor. This converter works with existing recessed cans that use medium base PAR16, R16, A19, R20, PAR20, BR25, BR30, R30, PAR30, BR38, PAR38, BR40 or R40 light bulbs and is suitable for damp locations. Perfect for kitchens, family rooms or anywhere recessed lighting is used. It includes a versatile white decorative medallion, adjustable bar, socket adapter and mounting hardware for convenient installation. Recessed Light Converter for Pendant or Light Fixtures is rated 4.6 out of 5 by 384. Rated 5 out of 5 by John from This is the perfect adapter. Easy install. Great... This is the perfect adapter. Easy install. Great price too, compared to several other retailers. Rated 5 out of 5 by Karen from Worked great. My metal recessed box was difficult to pierce... Worked great. My metal recessed box was difficult to pierce and I had to buy different screws but it worked great! Rated 1 out of 5 by HomeDepotCustomer from This converter was very difficult to install and the final... This converter was very difficult to install and the final result was a light ring not fitting against the ceiling as an example. I have much DIY experience and would not recommend this product unless you have a lot of time to devote to it's installation. Rated 5 out of 5 by CTS from It was easy to use, met my needs and was... It was easy to use, met my needs and was the right product at the right time. Rated 4 out of 5 by rick5503 from Does what it is supposed to do. Easy to install. Personally, I think it is grossly overpriced for... Does what it is supposed to do. Easy to install. Personally, I think it is grossly overpriced for what you get. Rated 5 out of 5 by Nick from Exactly what I expected. I would buy again.... Exactly what I expected. I would buy again. Can you use this with LED lights? Yes, this can be used LED light bulbs. Can you use the converter to add a ceiling fan in place of pot light? Hi, No it cannot be done since the converter ring is likely larger than the ceiling fan canopy.